Expert tip: This is one of the most popular yoga retreats offered in Turkey. Palace gokbel is an exclusive, private retreat, for adults only. Situated on a mountain, in amongst a pine forest with stunning panoramic views and sunsets over the beach. An idylic place to practice your yoga or just chill out. Palace gokbel offers a loyalty plan, guests returning for a second visit will be rewarded with a special discount. During this retreat, you will stay at Palace Gokbel, Turkey. 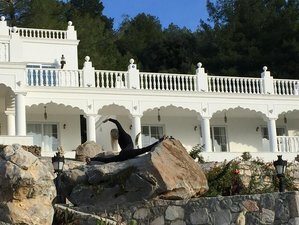 Palace Gokbel is a bespoke yoga retreat, nestled in a mountain, surrounded by natural pine forests and olive trees. The architecture of the building took inspiration from India, the home of yoga. The roof terrace has been dedicated to the practice of yoga as it is a vast space with incredible views. There are four twin rooms, one double room, and one single room with small double bed. The twin rooms have beds that can be pushed together for couples. All rooms are air conditioned and come with a luxury shower room, complimentary toiletries, slippers, and television. The view can be appreciated from all guest rooms, the pool area, seating area and outdoor restaurant. You can experience the most beautiful sunsets over turtle beach, the lake and mountain ranges. All rooms are also decorated in gold and white to create a classical yet relaxing atmosphere and furnished with natural fabrics to keep things light and cool. Tea and coffee facilities are located near room five, underneath the arches whilst room six has its own tea and coffee making facilities. Palace Gökbel can accommodate ten guests at any one time ensuring the experience is both intimate and free from overcrowding. In the morning, a yummy wake up smoothie is served in the lotus lounge area, nothing happens too early here at Palace Gokbel, allowing for guests to wake up in their own time and make sure they've had adequate sleep. The first yoga class will last for 120 minutes and includes a meditation, core and balance work, sun salutations and a sequence. Turkish breakfast is to follow and is served in the shaded picnic area. You will practice flow and Vinyasa yoga which combine flowing movements with some longer holds. It is a graceful discipline synchronization in order to maximize the benefits of the practice. Afterward yoga and breakfast, it is free time for you to chill by the pool, partake in an artistic pursuit, have some lunch, or take a trip to explore the local attractions. In the afternoon, you will practice Yin yoga which will take place on the roof terrace and lasts 90 minutes followed by 30-minutes personal relaxation. Come to both or pick just one. Yin yoga is a slower paced yoga which allows staying in a posture for a long period of time, letting gravity do its work, and really relaxing into the position. The calming nature of Yin yoga will help you to relieve tension and is an ideal way to calm yourself for relaxation and sleep. If you choose to sign up for a 30-minute personal session, during this time, you can pick a discipline of your choice, yoga, Pilates, or another fitness activity. The yoga teacher will be available for the majority of the day, to ask questions of her and seek advice on a yoga lifestyle. Since this is your holiday, all classes are optional hence you are free to do as you like. You will also enjoy an evening meal, with drink, served in the wine terrace with stunning sunsets over the water to be enjoyed and the perfect way of rounding up the day. You will also have the opportunity to chat and catch up with everyone else on the retreat. For hygienic purposes, you are advised to bring your own yoga mat. Times can vary slightly depending on the time of year and sunrise and sunset. Palace Gokbel offers one free excursion to Dalyan center, where you will find a variety of shops, restaurants and tea gardens, there is also a nice promenade along the river where you can view the rock tombs or maybe take the public boat to the beach or the rowing boat across the river. The excursion to dalyan includes a complimentary triple treatment at a traditional Turkish hamam. Where you are free to spend as much time as you need to, enjoying their facilities and hospitality. They also offer a complimentary excursion to Iztuzu Beach, where you can visit the turtle hospital or chill out on the beach. The 4.5-kilometers' long sandy beach, with clear shallow waters, is the perfect place to take a walk along the store line. The retreat is located in a small village, 10 kilometers from Dalyan, five kilometers from the beach, and 30 minutes from Dalaman Airport (DLM). Palace Gökbel is a small exclusive retreat, located in the traditional Turkish village of Gökbel which overlooks Turtle Beach, the lake, and the Dalyan Delta mountain ranges. Palace Gökbel is privately owned place with a committed team of staff who endeavor to make your stay as relaxing as possible. Dalyan town is blessed with many geographical attractions you can explore, including the Lycian Rock Tombs, Lake Koycegiz, the ruins of Caunos, the mud baths, and natural sulfur springs. Gökbel is also famous for turtle beach, a protected area, where the Carretta turtles come to lay their eggs. The beach itself is sandy with shallow warm waters and is just five kilometers away from the retreat. Another beautiful cove close to the retreat is Asi beach with rougher turquoise waters and a cafe overlooking the bay. During this retreat, you will be served a three-course meal every evening, made bespoke to each guest's requirements and using locally sourced food and lovely home cooking. Palace Gokbel takes inspiration from a variety of cultures, including Turkish, med, Indian, Asian. They offer Turkish wine and beer with the evening meal. For breakfast, they go Turkish style but pick out all the best bits to offer a totally healthy version of this classic. During your free time, you can opt to chill by the pool, snooze in a hammock, or simply just sit back and relax while enjoying the view with a glass of wine. You can also partake in artistic activities such as painting and writing as the scenery in Palace Gokbel is both breathtaking and inspiring. Other than that, you can also take yourself off to visit the local area such as The Rock Tombs, a boat trip, Asi beach, the mud baths, and the famous turtle beach. Not included in the price but a lovely experience would be an angel reading from a local Turkish woman. We also on occasion have a healer visit the retreat. One complimentary massage at the retreat. Please book your flight to arrive at Dalaman Airport (DLM). Private luxury transfer from this airport is complimentary. The return taxi price is approximately 180 TYR. It takes about 30 minutes to arrive at Palace Gokbel. Airport: Dalaman Airport Airport transfer included: Dalaman Airport No additional charges. You can request this in the next step. Palace Gokbel is a private wellness retreat located in the small village of Gokbel which overlooks the famous turtle beach, the lake, and Dalyan mountains.